Home / #AmericanRoadRadio / #Crime / #USChronicles / #USLocal / Wisconsin / #Crime Story : Teen,17 y.o.from #Wisconsin called #911 after shooting his Grandpa & Grandma ! 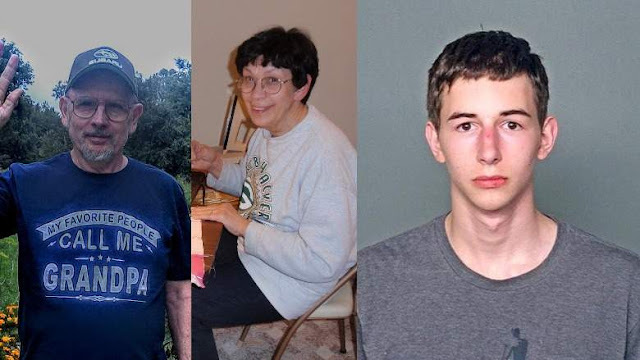 #Crime Story : Teen,17 y.o.from #Wisconsin called #911 after shooting his Grandpa & Grandma ! Alexander Kraus is a 17-year-old Neenah High School student accused of killing his grandparents in Grand Chute, Wisconsin, and plotting to “cause harm” at his school, authorities say. Kraus was taken into custody on Sunday, April 14, after the double homicide at a home on West Edgewood Drive, the Grand Chute Police Department said in a press release. Kraus fatally shot his grandfather, Dennis Kraus, 74, and his grandmother, Letha Kraus, 73, police said in a press release. Kraus lives in Neenah, Wisconsin, while his grandparents were residents of Grand Chute. Authorities have not said if they know why Dennis and Letha Kraus were shot by their grandson. According to Neenah school district officials, Kraus told police that he had been planning to harm fellow students at Neenah High School. Few details about the killings and the threat to the high school have been released so far. Kraus is being held at a local jail and is scheduled to appear in court on April 16. It is not known if he has hired an attorney who could speak on his behalf and his family could not be reached for comment by Heavy. Grand Chute and Neenah are located in Outagamie County, Wisconsin, near Green Bay.